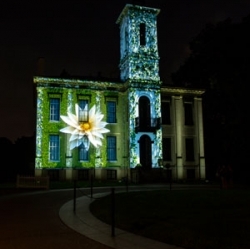 Beginning at dusk each night, Flora Borealis visitors will embark on a 1-mile journey through iconic Garden locations transformed through a combination of lights, moving images, and sounds that bring the Garden to life like never before. Open nightly at 6 p.m. Enjoy drinks and snacks for purchase and family-friendly activities in our beer garden. There will be live entertainment on select nights. Doors Open at 6 p.m. for all ticket holders to stroll Garden grounds until sunset, explore our Biergarten, and enjoy family-friendly activities before your Flora Borealis experience begins. Start your evening with backyard games and coloring activities nightly at the Biergarten. Your experience begins with the time listed on your ticket. To ensure the best experience, please be on garden grounds at least 15 minutes prior to your exhibit entry time. 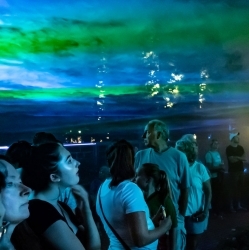 Kids can get in to Flora Borealis for just $5 on select nights. Enjoy family-friendly backyard games and coloring in the Biergarten. * Flora Borealis will not take place September 1–3 (Japanese Festival), September 22 (Rock the Garden), and October 5–7 (Best of Missouri Market). Get answers to all of your Flora Borealis questions! Looking for fun things to do in the St. Louis area this summer? Whether you're planning an evening of family fun, a Midwest weekend getaway, a romantic date night, a work happy hour, or a ladies night out, Flora Borealis offers a unique opportunity to spend time with friends and family and enjoy an unforgettable experience. Experience the unique sounds of Flora Borealis at home. The Garden wouldn't be the Garden without our Members, Donors, and Volunteers.